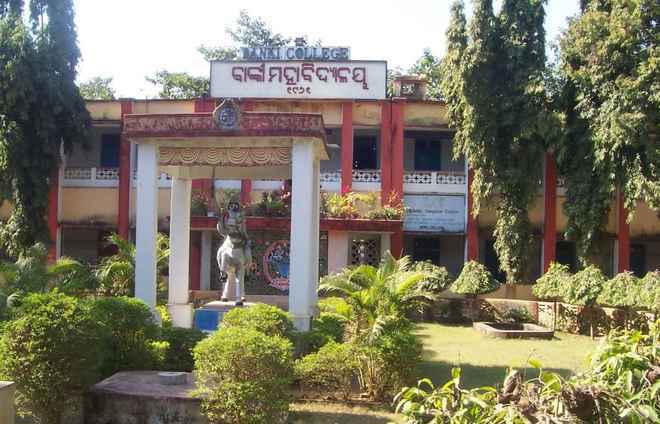 Banki College founded in 1961 is a premier semi-urban based educational institute of Odisha. For the last 57 years, it has been known for dedicated teaching and disciplined students. Purified by the river Mahanadi and blessed with Maa Charchika’s grace, the environment represents tranquility, natural beauty and calmness. This spirit inspires faculty and administration of the college, with diverse backgrounds; unite to translate the dreams and goals of this college in an atmosphere of warmth, care and togetherness. The college which came into being in 1961 has played a leading and innovative role in furthering the cause of higher education in the state. Right from the trying but pioneering early days of 1960s this tiny fledgling dedicatedly had taken up the mighty task of education against all possible odds and has been in the forefront of educational advance since then. It was an affiliated college of Utkal University till 2005. It has been functioning as an autonomous institution since November, 2005 as per the Government order and the conferment of autonomy by the UGC. The college was placed in Grade ‘B++’’ in 2007 after an assessment by the National Assessment and Accreditation Council (NAAC), an autonomous body of the University Grants Commission, New Delhi. Now its courses of +2 Arts, Science & Commerce are functioning under Banki Junior College and +3 Arts, Science & Commerce courses, Post Graduate course and other self-financing courses are under Banki Autonomous College. The average class size consists of 16/48 students in the Honours Programme for three year courses in Arts, Science and Commerce. Under the self-financing scheme there is two-year PG course in Sanskrit and Education. Under UG initiative the college conducts vocational course on Industrial Fish and Fishery and Seed Technology. For empowering self-employment generation, it also provides Certificate course in Mushroom culture, Interior Designing, Fashion Designing and Food Preservation & Nutrition. The college is located in a place of quiet beauty. It is 50 kms from Cuttack and 65 kms from Bhubaneswar by bus route and 34 kms from Khurda, the adjacent town. Banki is a Subdivision of Cuttack district and home to many eminent persons. It has a glorious historical background and rich cultural heritage. The college has also an added advantage of sharing the spiritual company of some of the well-known literary luminaries like Late Kabi Chandra Kalicharana Pattanaik (1897-1978); Late Pandit Gobinda Rath (1848-1918); Late Pandit Nilamani Bidyaratna (1886-1924). It has been enriched by the vibrant presence of the son of the soil, Dr. Jogesh Chadra Rout. He was a freedom fighter, Ex-Minister Odisha, pioneer of the Co-operative Movement in Odisha, eminent educationist, founder of Banki College and other Colleges and schools in the area and outstanding social activist. He was awarded the honour of Banki Gandhi, Samabaya Ratna, Biswakarma of modern Banki. Similarly, the college is privileged to have alumni and association of dignitaries like Late Banchanidhi Kar, a legal luminary after whom the college library has been named; Prof (Dr.) Debendra Ch. Mishra, eminent Economist and former Vice-Chancellor of Sambalpur University and Director of Schools and Higher Education; Late Prof. (Dr.) Kunja Bihari Tripathy an eminent Sanskrit scholar and well-versed in Pali Language; Prof. (Dr.) Birendra Kishore Das a renowned Physician of Lucknow Medical College, Late Sri Balarama Mishra, Dr Bijayananada Tripathy, Rtd. Prof. Ophthalmology & Principal of S.C.B Medical College, Cuttack; Late Dr. Sarat Chandra Mishra, Rtd. Prof. of medicine, S.C.B. Medical College, Late Barrister Raghumani Pattnayak, Supreme Court lawyer; Late Prof. (Dr.) Bana Bihar Pattanaik, Rtd. Prof. Pathology & Principal S.C.B Medical College, Cuttack, Late Rai Bahudar Vidyadhar Panda the Father of credit Co-operative Movement in Odisha,; Sri Premananda Tripathy, IAS, Rtd. Secretary to Govt. of India; Late Rai Bahadur Khagendra Chandra Mohapatra, Ex-Honorary Magistrate and Ex-president, Banki Union Board; Sri Sarangadhar Raiguru, IPS; Dr Bibhuti Bhusan Tripathy, Rtd. Prof. Medicine, S.C.B Medical College, Cuttack; and diabetic specialist. Sri B. B. Nanda, IPS, Rtd. Director General of Police, CISF, New Delhi, Sri Ajit Kumar Tripathy, IAS Chief Secretary, Govt. of Odisha; Prof. Abhaya Charan Nayak, Melbourne University, Australia, Dr J. P. Das Rtd. Cardiologist, S.C.B Medical College, Cuttack. Banki has also received the bounteous service of the noted Oriya Novelist VYASA KABI Fakir Mohan Senapati, Ex-Manager of Ex-Estate, Dompara, Banki. In addition, Banki has produced many literary luminaries like Poet Late Gokulananda Praharaj, Ex-MLA, Banki; Late Natabar Dhal, noted poet, Sri Debaraj Lenka, Novelist; Sri Jambeswara Maharana, noted Pala Gayak; Sri Hemanta Kumar Das. Noted cinema actor crowned with the famous Jayadeva Award and innumerable other literary figures freedom fighters, militants, Paikas Dala Beheras and Late Bira Rani Sukadei. Banki is a sacred place and pilgrim centre for the temple of Goddess Maa Charchika , Parsuram Pitha in Ruchika Giri Hill, Ramnath and Baidyanath temple believed to be of Ramayana era and six Pandava Gumphas of Mahabharat era. We believe that in these past few years this college has flourished significantly. Introduction of the career oriented vocational and certificate courses added feathers in its cap. The teachers are taking constructive and purposeful action to produce optimistic, independent, compassionate life-long learners who will bring glory to the college, state and nation.